The lengthy history of French music begans back in the 10th century with court songs and chivalrous music. Much of France's early folk music was instrumental, with very few and very simple instruments; but there was a group of poet-composers who began their work around the 10th century as well. From this point forward, France has an illustrious musical history, ranging from opera to classical, to pop and rock in the 20th century. In order to do justice to French music, one would have to write an entire series of books on each type of music in the history of music in France. Here, a short summary can pique your appetite. The first operas appeared in France during the mid-17th century. While the first operas were experimental, opera was soon met with considerable enthusiasm in Paris, especially the operas based on the Italian opera of the time. 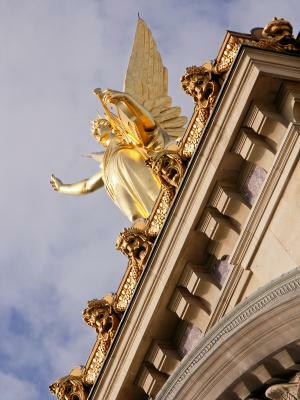 During the reign of Louis XIV, Italian-style opera began to flourish in France. However, it was in the 19th century that most operas one would recognize the names of today came into being. Classics from Georges Bizet, such as Carmen, date from this time, and are still widely appreciated around the world. The most celebrated classical music era from France is known as the Romantic Era, which closely resembles the period of Romantic French literature and poetry. Set during the 19th century, famous French musicians like Ravel and Debussy were able to compose classical masterpieces that were not only appreciated in France at the time, but also made their way around the world, wowing audiences and inspiring composers in other countries.Erik Satie is another famous French composer from this era, although his music is not generally classified as belonging to the Romantic movement. Satie's compositions are still viewed as ahead of their time. In the 20th century, music in France took a turn for the modern, much as music did in many regions of the world. Many composers experimented with new sounds and rhythms, and the history of French music is also made richer by the French invention of 'spectral music'. This invention is a form of computer-aided musical composition, and its capabilities are still not quite fully appreciated around the world. It is hard to classify a particular history of folk music in France. Because of its regional nature, there is no one French folk music, and no single timeline along which folk music evolved. Folk music in France is rather a series of folk music types in different regions of the country. In southern regions, the folk music resembled Spanish or Italian folk music, and in the eastern mountains, Swiss or German influences played a role in folk music. The North of France, as well as the Atlantic Coast, each had fairly individualized genres of folk music that were part of the local community and artistic life. Popular music in France began in the 19th century, but carried over into the 20th century before changing genres. The earliest period ranges from the late 1800s to about 1930, when dance hall singers made popular music for local audiences. This atmosphere metamorphosed into the French 'chanson', which is still a popular genre of French song today, usually on the topic of love. Famous artists of the popular music scene include the unforgettable Edith Piaf, classics like Georges Brassens, and rockers like Johnny Hallyday. Near the end of the 20th century, music from Northern Africa migrated to France, as well as American hip hop; both have enjoyed a certain degree of popularity, with hip hop becoming a full genre of French rap in the 1990s. All in all, the history of French music is long and varied. While many of the later elements in French music can also be found in American music, French music started much earlier than American music. Even once America was colonized and then became independent, music was rather scarce. If one compares American musical history to that of France, the range, as well as the length, of the history is impressive.